Two alarming new pieces of evidence that the BP oil spill is spreading well beyond the Gulf Coast. 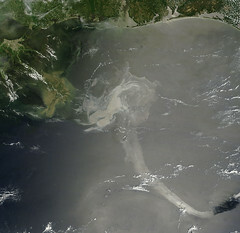 The first is this photo from NASA, showing a plume of oil being pulled far to the south, apparently by the Gulf’s loop current. Scientists had warned that was the first step towards the oil washing up in the Florida Keys — and that ultimately, the oil could reach the East Coast. Coast Guard officials have found nearly two dozen tar balls on Key West shores but have not determined if they came from the Gulf of Mexico’s massive oil disaster. Anyone who sees a tar ball is asked to call the Coast Guard at 1-800-424-8802. Oiled shorelines can be reported to 1-866-448-5816. For all the latest news on how the oil spill is impacting the Gulf Coast’s wildlife & to learn how you can help, visit www.nwf.org/oilspill.